Hmm... Chinese neofolk? Not bad, not bad. It was the first Chinese dark folk album I ever heard, and I still like it a lot, despite its quality of production (it really sounds like a home-made demo... but who cares?) My personal favourites on this album are "Body-Chain", "You Can Smile" and "Love of the Fall" (even though the voice in the last mentioned track sounds a bit weird). Beautiful music, the truly melancholic atmosphere... check it out! From last.fm: "Bloody Woods is a Chinese neofolk project started in early 2005 by Bai Shui (白水, Eltan Renaxy). Late december 2005, Gu Dao joined Bloody Woods as guest vocalist. August 2006 saw the selfreleased EP “Women In The Hole”. One month later, Go Dao and Bai Shui’s roads diverged again, making Bloody Woods a one-man project again". 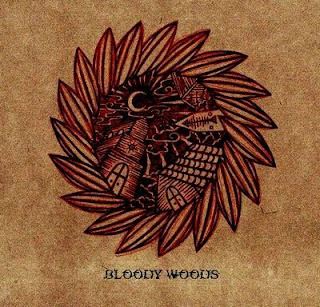 Don't know if Bloody Woods are still active, but Eltan Renaxy are very good too, and I'm going to post their album right now.